While political speech in India is mired in the ’70s doublespeak jargon, agitations too are stuck in between the Independence struggle and the strident trade unionism of the ’80s. Agitations in India are held at the drop of a hat. Be it for hike in pay, increase in allowance, regularisation of jobs, back wages of sick PSUs, accident compensation, shortages in public utilities, venting public anger against price rise etc. Like a broken record, on and on, the slogans are repeated. Often those voicing them do not even comprehend what they mean. Just about anything from sublime to nonsense for which a case can be made out for government intervention, is worthy of an agitation. 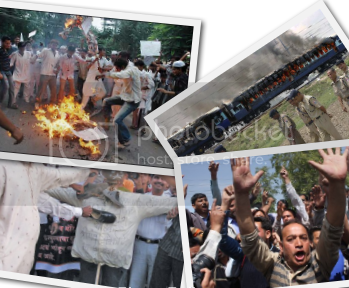 The various methods used for agitation are: strike, fasting, slogan shouting, effigy burning, ‘gherao’ , ‘dharna’, ‘bandh’, ‘satyagraha’, rallies, token arrest, protest march, burning tyres, damaging government property, burning buses, smashing cars, obstructing railways, stone pelting etc. From being largely instinctive earlier they have all now been reduced to well choreographed, carefully orchestrated, skillfully enacted pieces of drama. Effigy burning, slogan shouting, ‘Gherao’,’dharna’ are all played to the gallery with majority of action reserved for the camera. Token arrests likewise feature a bout of spirited slogan shouting, jostling with the Police, then being packed into buses, detained at a playground and ultimately being let off as if returning from a day long picnic. The efficacy of these hackneyed forms of agitation in fulfilling their desired goals is declining by the day, forcing people to use even more violence to cause greater disruption of public order. The one thing that is common to all forms of agitation though is public hardship. The targets of the public anger on the other hand are rarely, if ever put to inconvenience. Agitations are in a desperate need for innovation. The need for innovation is driven by growing public disenchantment with the means of agitation as well as changes in the underlying assumptions on which most agitations are modeled. Whereas earlier protests were meant to cripple the economy, causing financial losses to the British (or the businessmen) to eventually drive them to quit. The opponents now in our day to day battles are however not going anywhere else. The losses too return to haunt us eventually in the forms of botched up services, additional tax burden or rising prices. It is especially harsh on the daily wage earners whose wage loss may, at the end of the day, entail hungry stomachs. Biggest irony is that for a country that prides itself for having successfully used non violence to fight the foreigners, now freely uses violence and arson to fight against its own. There have been minor innovations in the past such as begging bowl demonstrations, boot polish protests or even naked demonstrations – yet nothing has caught the public imagination. The only recent innovation that caused a flutter was ‘Gandhigiri‘ but that too seems to be fizzling out. We could do with a lot of new ideas on how to make the government responsive while causing minimum disruption. Ideas for new innovation could include an early start (possibly 6 AM instead of 10 AM) to a ‘strike day’ ending in a symbolic protest. Other ideas could include switching off electricity at predetermined hour, declaring a protest to be ‘bicycle only’ day, or wearing clothes of the same color, or mass planting of trees etc. The online protests meanwhile will keep gathering steam from ‘Pink Chaddi‘ to Boobquake to the trending topics on Twitter. The next wave of agitation innovations will be driven by public acceptance shaped by media appreciation of ideas that harp on constructive engagement instead of public disruption.